It's instant Christmas spirit in a tin! Say you're on a long plane flight and everyone around you is frowning and grumpy. Just open this tin, blow up the inflatable white vinyl beard and pop the Santa hat on your head. Before you know it, everyone is going to be sitting on your lap, laughing and asking for presents. 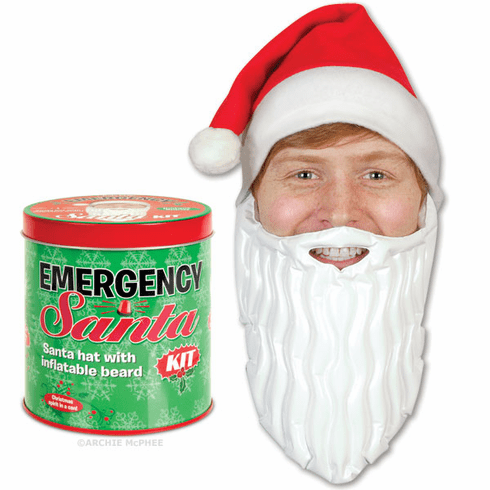 Kit comes with a Santa hat that is sized to fit most adult heads and a 10" (25.4 cm) long, vinyl inflatable beard with elastic loops that go around your ears. Comes in a 3-3/4" (9.5 cm) diameter x 4" (10.2 cm) tall collectable tin.